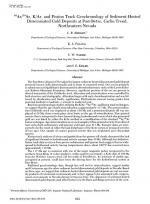 Автор(ы): Arehart G.B., Foland K.A., Kesler S.E., Naeser C.W. 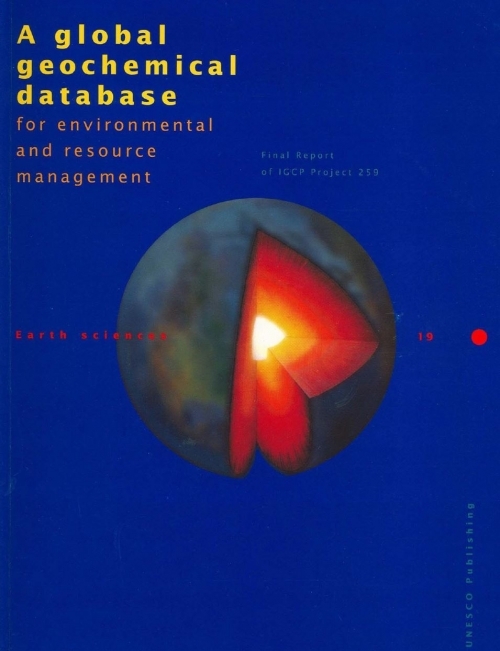 Издание: Economic geology, 1993 г., 25 стр. The Post-Betze deposit of Nevada is the largest sediment-hosted disseminated gold deposit presently known, both dimensionally and in terms of contained metal. Ore occurs primarily as submicron-sized gold that is disseminated in altered sedimentary rocks of the Lower Paleozoic Roberts Mountains Formation. However, significant portions of the ore are present in altered monzonite of the Goldstrike stock. Alteration and mineralization were controlled by both structure and stratigraphy. Alteration began with early decarbonatization and was followed by silicification and, finally, argillization. Phyllosilicate mineral zoning grades from proximal kaolinite to kaolinite + sericite to unaltered rock. We appreciate the comments on our paper on the Post-Betze sediment-hosted disseminated gold deposit which indicate that clarification is required. 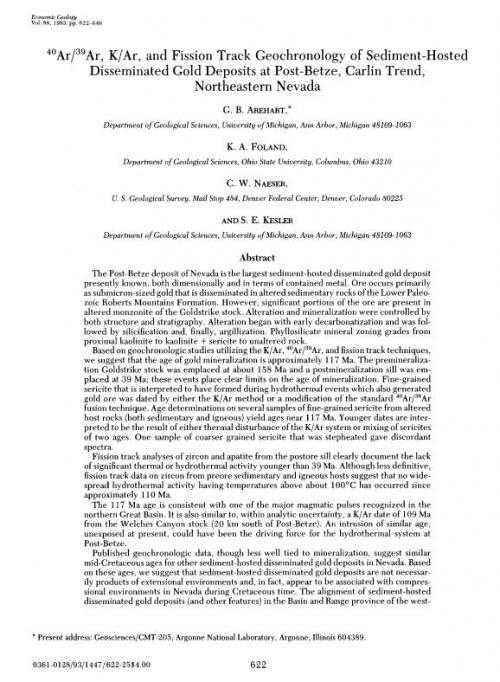 Ilchik suggests alternative interpretations of our findings with regard to two main issues: the nature of the sill that we have described as "postore," and the absolute age of Post-Betze mineralization in the context of the overall spread in the dates presented in our paper. We address these issues in turn. The postore sill, which we also loosely originally termed "dike," is important in that it brackets the timing of gold mineralization. Although Ilchik suggests that this intrusion predates mineralization, the weight of evidence is to the contrary. Whereas the postore sill is composition-ally similar to preore Goldstrike stock-equivalent rocks, it is texturally quite distinct. In fact, it was distinctive enough for us to map it out in the subsurface from drill core, something which we were unable to do for any of the other sills. Comparatively, the rock is little altered and it is the only one in the ore zone that retains primary bio-tite. Assays shown in figure 5 of Arehart et al. 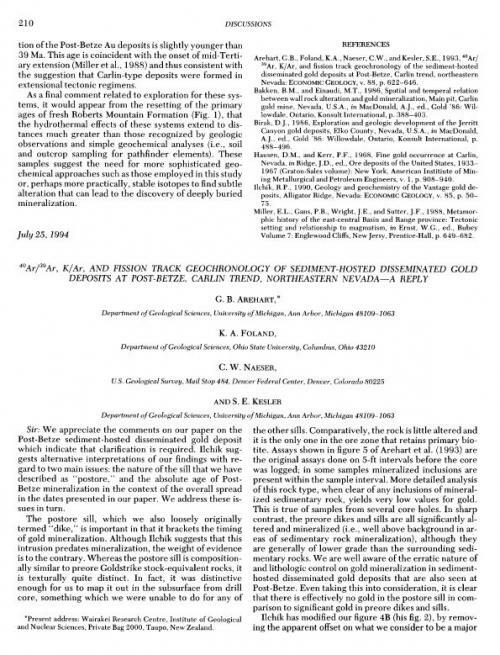 (1993) are the original assays done on 5-ft intervals before the core was logged; in some samples mineralized inclusions are present within the sample interval. More detailed analysis of this rock type, when clear of any inclusions of mineralized sedimentary rock, yields very low values for gold. This is true of samples from several core holes. In sharp contrast, the preore dikes and sills are all significantly altered and mineralized (i.e., well above background in areas of sedimentary rock mineralization), although they are generally of lower grade than the surrounding sedimentary rocks. We are well aware of the erratic nature of and lithologic control on gold mineralization in sediment-hosted disseminated gold deposits that are also seen at Post-Betze. Even taking this into consideration, it is clear that there is effectively no gold in the postore sill in comparison to significant gold in preore dikes and sills. Издание: РГГРУ, Москва, 2005 г., 183 стр. История геофизического факультета МГРИ-МГГРУ теснейшим образом связана со становлением геофизической службы в нашей стране. Геофизические методы начали интенсивно развиваться в двадцатых годах прошлого столетия как новые прогрессивные способы изучения земной коры на основе наблюдений различных физических полей, распределение или характер которых отражают влияние геологической среды – горных пород, слагающих земную кору, на том или ином участке исследований и отличающиеся друг от друга по физическим свойствам. Впервые эффективность геофизических методов в России была показана в процессе изучения Курской магнитной аномалии, где они применялись в больших объемах. В этих работах участвовал академик П.П. Лазарев, будущий академик Г.А. Гамбурцев, профессора А.И. Заборовский и Л.В. Сорокин, которые впоследствии вместе с профессорами В.И. Барановым и В.Ф. Бончковским приняли участие в создании геофизической специальности в МГРИ. 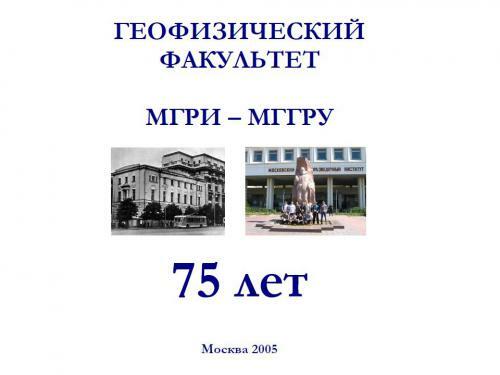 Автор(ы): Gallois R., Hart M.
Издание: Plymouth University, Plymouth, 2009 г., 25 стр. Автор(ы): Gale A., Hart M.., Hesselbo S., Wimbledon B.
Издание: Plymouth University, Plymouth, 2009 г., 39 стр. 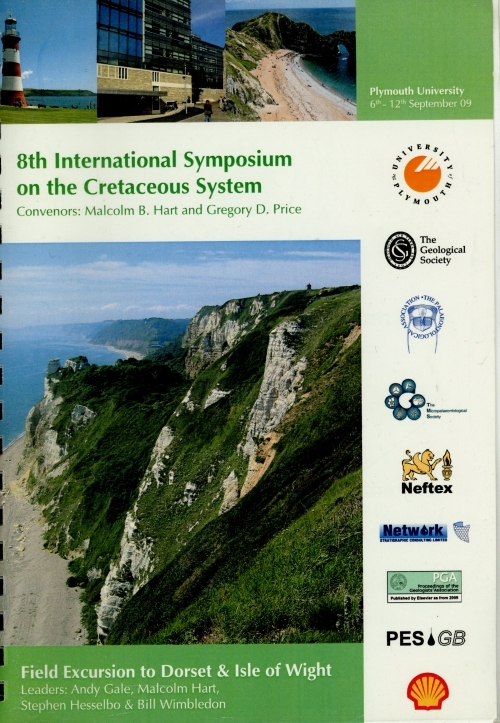 In 2001 the Dorset and east Devon Coast was inscribed on the UNESCO World Heritage List as a place of outstanding universal value on the basis of its geological succession, coastal processes and landforms and its place in the history of the development of geology (especially stratigraphy and palaeontology). Extending from Orcombe Point in the west to Studland in the east, this World Heritage Site's 85 miles of coastline contains a record of 185 million years of Earth history. 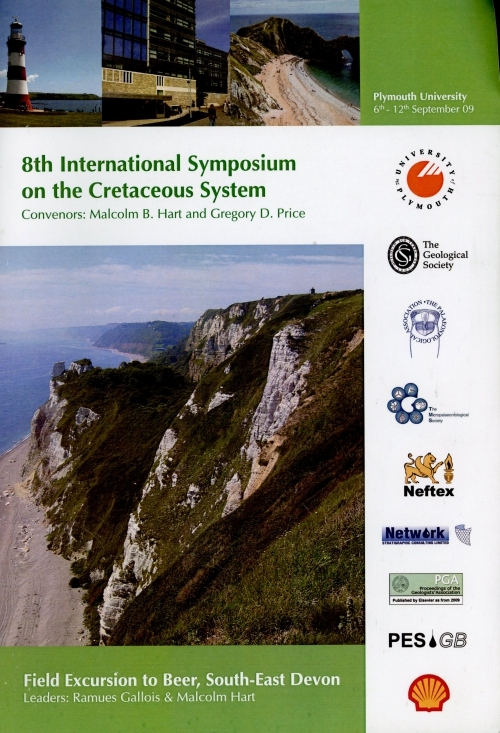 At the time of the proposal being submitted to UNESCO there were discussions about whether the planned site could be extended westwards to Torquay, covering the Permian and the Devonian rocks of Teignmouth, Dawlish and Torquay or eastwards to include the Isle of Wight. For various reasons (mostly non-geological) it was decided not to expand the proposed site further, although the Isle of Wight would have been the natural extension of the site, including more of the Cretaceous succession as well as the marine Cenozoic succession of the Hampshire Basin. This excursion is, in reality, looking at what the expanded site would have included. Автор(ы): Stel H, Veenhof R.P. 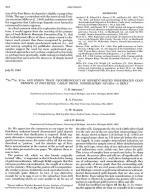 Издание: Elsevier, 1991 г., 14 стр. 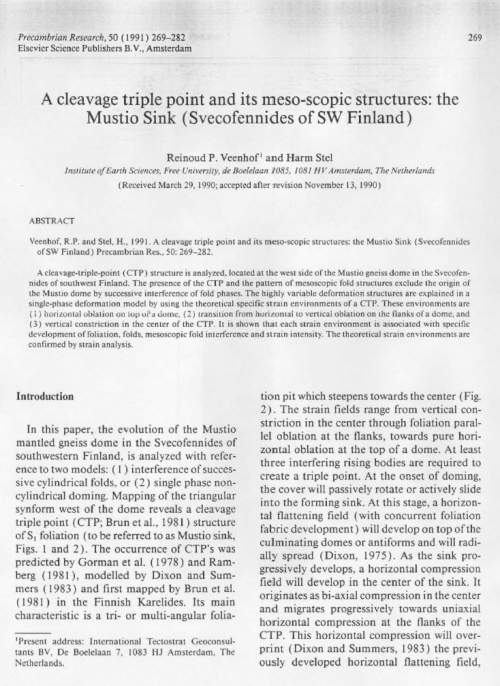 A cleavage-triple-point (CTP) structure is analyzed, located at the west side of the Mustio gneiss dome in the Svecofennides of southwest Finland. 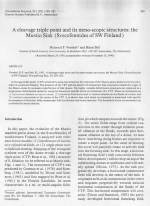 The presence of the CTP and the pattern of mesoscopic fold structures exclude the origin of the Mustio dome by successive interference of fold phases. The highly variable deformation structures are explained in a single-phase deformation model by using the theoretical specific strain environments ofa CTP. These environment are (1) horizontal oblation on lop ofa dome, (2) transition from horizontal to vertical obiation on ihe flanks ofa dome, and (3) vertical constriction in the center of the CTP, It is shown that each strain environment is associated with specific development of foliation, folds, mesoscopic fold interference and strain intensity. The theoretical strain environments are confirmed by strain analysis. Автор(ы): Аверьянов А.О., Архангельский М.С., Иванов А.В., Первушов Е.М. Издание: Москва, 2005 г., 7 стр. A distal fragment of a radius of Azhdarchidae indet. from Upper Campanian (Upper Cretaceous) marine deposits of Saratov is described. The bone belongs to a large pterosaur, of about 4.3 m wing span. It differs from the radii of Azhdarcho, Montanazhdarcho, and cf. Quetzalcoatlus in the asymmetrical distal epi-physis and, in addition, from Montanazhdarcho and cf. Quetzalcoatlus in the absence of a pneumatic foramen on the posterior side. 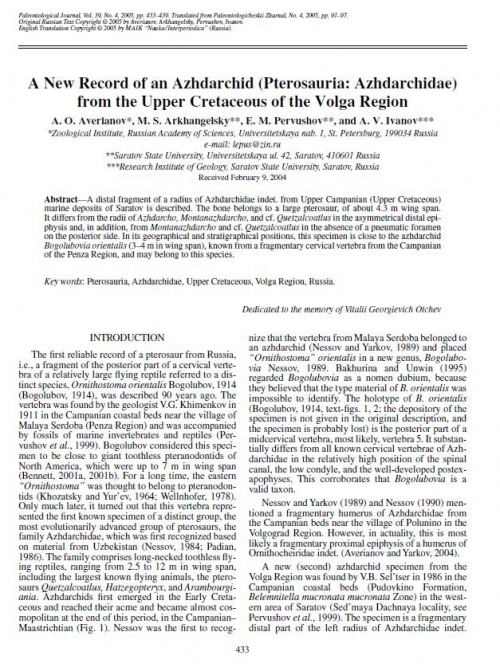 In its geographical and stratigraphical positions, this specimen is close to the azhdarchid Bogolubovia orientalis (3–4 m in wing span), known from a fragmentary cervical vertebra from the Campanian of the Penza Region, and may belong to this species. 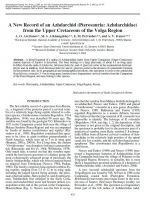 Автор(ы): Xiaoling W., Yinxiu L.
Издание: Journal of Geochemical Exploration, 1995 г., 5 стр. 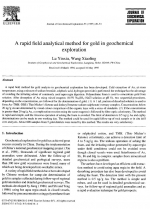 A rapid field method for gold analysis in geochemical exploration has been developed. Cold extraction of Au, at room temperature, using a mixture of sodium bromide, sulphuric acid, hydrogen peroxide is performed; the technique has the advantage of avoiding the irritating odour of commonly used aqua regia digestion. Polyurethane foam is used to concentrate gold from solution. After desorption of Au using mixed reagents (0.5% Na2S03-NaCl solution at pH 8), two sequential procedures, depending on the concentration, are followed for the determination of gold. (1) A 1 mL portion of desorbed solution is used to form Au-TMK-DBS (Thio Micher's Ketone and dodecyl benzene sodium sulphonate) ternary complex. Concentrations below 20 ng/g Au are determined by visual colour comparison of the organic layer with a series of standards. (2) If the concentration is greater than 20 ng/g Au, a complexation reaction using the same reagents is followed by fibre-optic colorimetry. The method is rapid and simple, and the tiresome operation of ashing the foam is avoided. The limit of detection is 0.5 ng/g Au and eighty determinations can be made in one working day. The method could be used for rapid follow-up of rock sample or in situ drill core analyses. 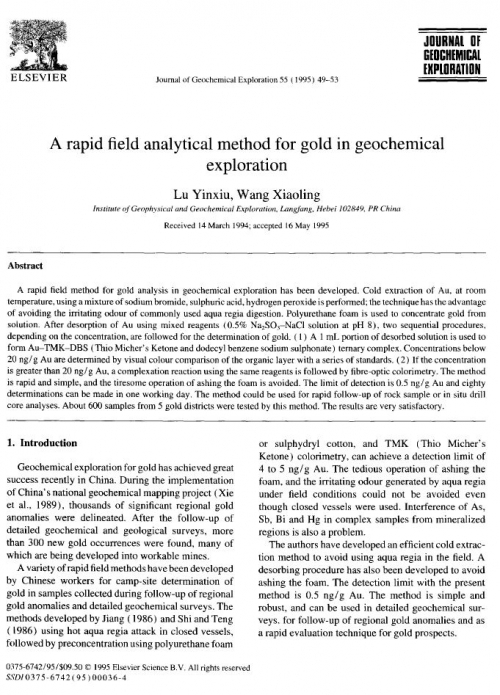 About 600 samples from 5 gold districts were tested by this method. The results are very satisfactory. 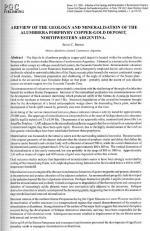 A Review of the Geology and Mineralisation of the Alumbrera Porphyry Copper-Gold Deposit, Northwestern Argentina. Издание: PGS Publishing, Linden Park, 2005 г., 16 стр. The Bajo de la Alumbrera porphyry copper-gold deposit is located within the northern Sierras Pampeanas in the eastern Andes Mountains of northwestern Argentina. It formed in a tectonically favourable location within a major arc-oblique wrench fault system, the Tucuman Transfer Zone. Initial andesitic volcanism deposited on crystalline Lower Palaeozoic basement, and subsequently emplaced dacitic subvolcanic stocks are directly related to eastward subduction of the Nazca oceanic plate beneath the western continental margin of South America. 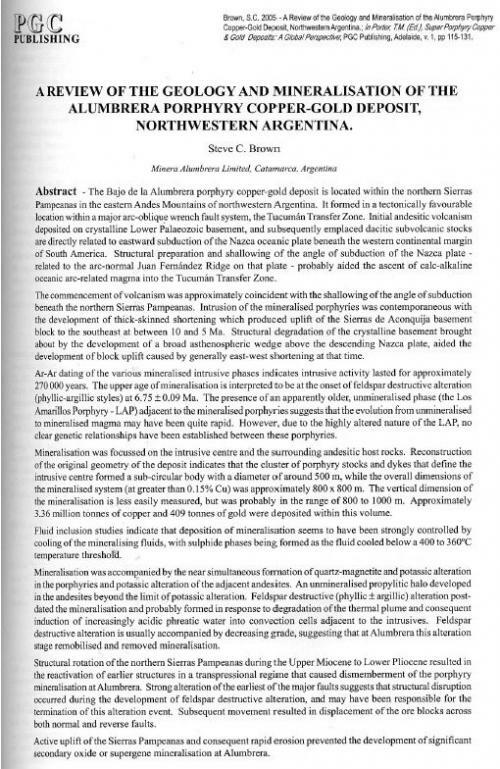 Structural preparation and shallowing of the angle of subduction of the Nazca plate -related to the arc-normal Juan Fernandez Ridge on that plate - probably aided the ascent of calc-alkaline oceanic arc-related magma into the Tucuman Transfer Zone.